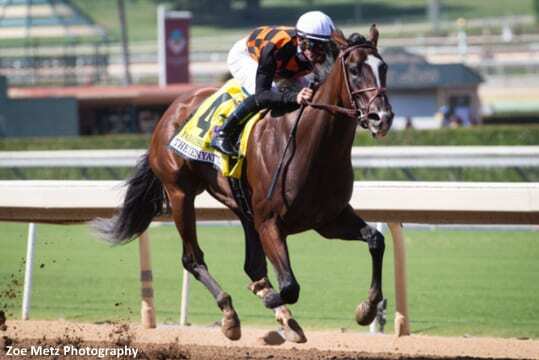 Multiple Grade I winner Paradise Woods is scheduled to make her first start under the direction of trainer John Shirreffs in this Saturday's Grade II Santa Monica Stakes at Santa Anita for older fillies and mares at seven furlongs. It would mark the first race in seven months for the five-year-old daughter of Union Rags formerly trained by Richard Mandella. “She's been breezing very nicely,” Shirreffs said, alluding to two of her most recent drills being the fastest of the day at the distance of six furlongs, a 1:11.60 move from the gate on Jan. 26 followed by a 1:10.80 recorded on Friday. “I'm just hoping for good weather,” added Shirreffs, who has had Paradise Woods in his care since December. Joel Rosario, who has expressed keen satisfaction working her, rides her for the first time competitively. Flavien Prat, who had ridden Paradise Woods in all of her previous 11 races, will be at Laurel Park Saturday to ride Spiced Perfection for Peter Miller in the Barbara Fritchie Stakes. As the trainer of super mare Zenyatta, John Shirreffs would know. Working on a fast main track Sunday for possible Santa Monica starts were a trio of Bob Baffert runners–Dream Tree, Emboldened and Marley's Freedom. The latter two went five furlongs in company and were clocked in identical bullet times of 58.80. Dream Tree, working solo, also received a bullet for a six furlong move in 1:11.60. This entry was posted in NL List, Racing and tagged joel rosario, john shirreffs, paradise woods, richard mandella, santa anita park, santa monica stakes, Union Rags by Ed Golden/Santa Anita. Bookmark the permalink.